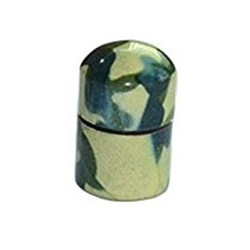 These nano caches are made from anodized aluminum, making them more corrosion and wear resistant. The camo pattern was manufacture painted to hold up for years no matter what the elements may bring. The have a strong internal glued magnet and an o-ring for weather protection. Each one comes with one of our Ready-To-Hide custom log sheets.